The Korean Women's Institute (KWI) was founded on 1st March 1977, as one of the auxiliary research centers of Ewha Womans University, to do research on Korean women's issues with a vision of gender equality. KWI had made a contribution to open the first undergraduate course of Women's Studies in South Korea in September 1977, and the first master's degree program in Women's Studies in March 1982 too. 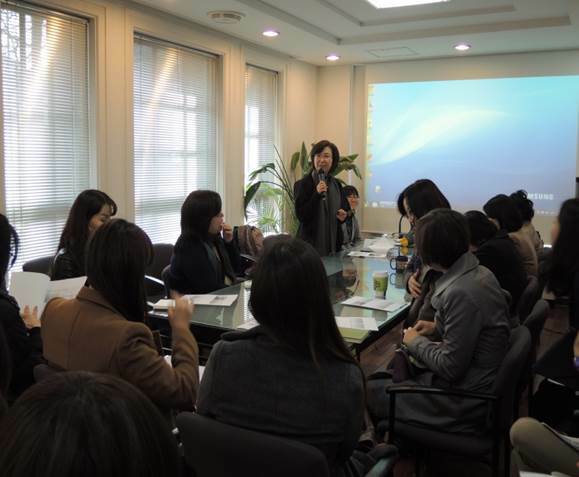 Since then, KWI has played a leading role in organizing academic exchanges between women's research institutes in Korea. It initiated the founding of the Korean Association of Women's Studies(KAWS) in 1984, the first nation-wide academic society for Women's Studies. Since 1995 when the Asian Center for Women's Studies(ACWS) was established under KWI as the umbrella organization, KWI has played a leading role in the development of Women's Studies in Asia and focused on establishing the idea of Asian Women's Studies. From December 1999 to December 2005, KWI had been selected as one of the research centers by the National Research Foundation of Korea(NRFK) and has extended its research into gender in Asia as well as in South Korea. KWI researched on “Globalization and Gender” to rethink the problems of glo/localization from a feminist perspective as the fund of NRFK from 1999 to 2005, Since December 2005, KWI have been working on a variety of cultural, socio-economic, and political projects, "Global Cultural Changes and Women’s Post-colonial Experiences in Asia", "Producing Feminist Knowledge in Asia and Constructing the Category of ‘Asian Women's Studies" and "Building Asian Women's Studies.’ These projects aim to theorize Asian women’s experiences and to produce alternative feminist knowledge beyond Eurocentrism in feminist knowledge. KWI regularly offers seminars on <Women/Gender Studies>, <Lecture Series on Asian Women's Studies> and <The Ewha Women's Studies Forum>. KWI has played a significant role in advancing new issues and discourse of Women’s/Gender Studies through diverse academic activities such as seminars, special lectures and forums, conferences, and workshops for professional gender researchers and publications. In addition, KWI has made networks with national and international scholars in order to build international women’s exchange and solidarity. Over the years, KWI has consistently pursued joint projects and co-worked with many universities and institutions such as Korean Women’s Development Institute (KWDI), National Human Rights Commission in Korea, Korean Oral History Research Center and Feminist Artist Network, University of Maryland, Emory University, Peking University(北京大學), Nanjing Normal University(南京师范大学), YanBian University Women's Studies Center(延边大学女性研究中心), and Ochnomizu University, etc. KWI had published many books on the themes of Korean women’s history and unification and women. Since the 2000s, the list has included Feminist Alternative Values in the Age of Globalization, Women and Public Policy Changes in the age of Globalization, Locational Feminism in Era of Globalization, Asian Women and Border Crossing, Post/modern Asia from Multiple Women’s Perspectives, Immigration and Gender in Globalized Asia, and The State and Gender in South Korea, Gender Budgeting in South Korea. KWI has also published books in English such as Globalization and Feminism in Korea and Feminist Cultural Politics in Korea. In addition, Women's Studies Review(KCI), the first peer review journal on Women’s Studies in South Korea founded in 1984, has biannually been published. Asian Center for Women's Studies have been established since 1995. The center has been creating and maintaining many different projects throughout. Based on Women's education, it has a history of educating women for almost 130 years and over 30 years of educating Women's Studies. For last 20 years, Asian Center for Women's Studies worked hard for the systemization and development of Women's studies. They have been creating Asian Women's studies curriculums as well as its texts. English Scholarly journal called Asian Journal of Women's Studies have been launched and the center established academic exchanges of Women's Studies scholars as well as the education of next-generation scholars. From 2012, Ewha Global Empowerment Program(EGEP) was held every semester in aim to strengthen the abilities and empower the women activists of Asia and Africa and also to develop women leaders of the next-generation. Through this, a new community of Women's Studies knowledge production have been created as well as the forge of network and solidarity among them. Education of theory and practice of Women's Studies, research and field are also shared. Since 2012, Ewha Global Empowerment Program(EGEP) happens two times every year for two weeks each session. It is one of the programs to educate women and is to empower women activists of non-governmental public sectors in Asia and Africa. Also this program works together with UN women to increase women's rights and to achieve gender equality world-wide. January of 2015, at the point of 7th session, 1800 women from 85 countries applied for this program and 149 women from 37 countries have successfully completed the course. : Publishing the first issue in 1995, Asian Journal of Women’s Studies has been quarterly journal since 1997. It is known as 'The first international English written journal of Women's Studies in Korea' as well as ‘The first in Korean Social Science to be registered in SSCI. With these titles, this journal aims to be the model of internationalization of Korean journals. : Yosong’hak-Non’jib (Women’s Studies Review) is a periodical published bi-annually by KWI since 1984 as a feminist journal. In 2008, as this journal was assigned to be the registration scientific journal by Korean Research Foundation, the excellence of this Women's Studies journal was recognized once more. This journal covers diverse research areas ranging from research papers on women's issues conducted from a feminist perspective, book reviews on recent feminist publications, reports on field surveys, research reports on women's policies, etc. It selects manuscripts through the processes of contribution and examination, and aims to find and publicize outstanding articles in Women's Studies. KWI has made great efforts to improve gender equality in our society and academic community through research, academic exchange, publications, and education. By focusing on Asian Women’s Studies as well as Korean Women’s Studies, KWI has played a key role in producing feminist knowledge on the national and international level.